Faith Fighter Pulled By Creators After "Manufactured Controversy"
Turns out you can get video games removed from the internet. 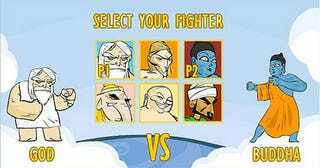 All you need to do is offend the sensibilities of three major religions, as Molleindustria's online god fighting game Faith Fighter did. The Italian group of artists and programmers removed the 2D fighter from its web site today, following an official statement from the Organization of Islamic Conference, according to Molleindustria, and a "successfully manufactured [...] controversy" from news outlet Metro UK. "Faith Fighter depicted in a mildly politically incorrect way all the major religions as a response to the one-way islamophobic satire of the Danish Mohammad cartoons," reads a statement from Molleindustria. "If a [sic] established organization didn't understand the irony and the message of the game and is claiming it is inciting intolerance, we simply failed." Molleindustria says that Faith Fighter, which was released online over a year ago but was apparently recently noticed by concerned religious groups or late-to-the-party Metro editorial staff, only received two formal complaints from "two catholic players" prior to this week. "This has happened before with games as Super Columbine Massacre RPG, Virtual Jihadi and our Operation: Pedopriest, works that attracted heavy criticism based on false assumptions spread by mass media," reads the statement. Molleindustria calls the removal of Faith Fighter a "symbolic act," as the game is available via other sources, including popular Flash game web site Newgrounds.com.